After weeks battling for the best ported app to the Windows 8 app platform. 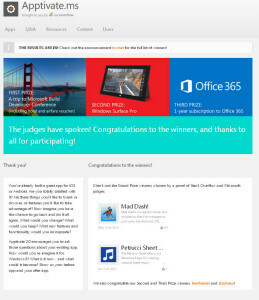 My app won the contest, here is the link and not only did I win I won the grand prize which was a Trip to San Francisco to the Microsoft Build 2013 conference, which was great I met some really exciting developers. I learned that Microsoft really does care about it’s developers and everyone who is interested in the future of Windows 8. It was fun to play on a 82′ inch tablet and dance in front of a Microsoft Kinect. I attended sessions about XAML, Windows Store, Windows Phone 8, Windows 8, Visual Studio 2013 development, Kinect Programing, Bing API development, TypeScript, and also some sessions about Azure. The future is really bright for Microsoft and I see that the platform is getting better. I did like some of the enhancements with Windows 8.1 but I’m new to Windows 8 in general so I’m still learning everything it feels like. The way thousands of developers hang out and talk about apps or what they are passionate about in technology was very interesting to me. Meeting developers from France, Finland, Chicago, Japan, Germany, Ireland, and Philadelphia. Were just a few of the places people traveled from to be at build. The 3D printers also were very cool, I’ve never seen one print out. It was exciting to see it print out although it smells like burning plastic and it takes probably hours for one 3D model to finish. Overall my time in San Francisco was great I learned a lot and made some connections and rediscovered my love for Sourdough bread. I also liked that web technologies was a big focus at the conference and that Microsoft it putting a heavy investment in the web so my future endeavors will be worth my time. I hope to learn more about Microsoft tools and software as Windows 8.1 comes out in November. Thanks again to Microsoft for sending me to the build conference. Feel free to leave some comments below.